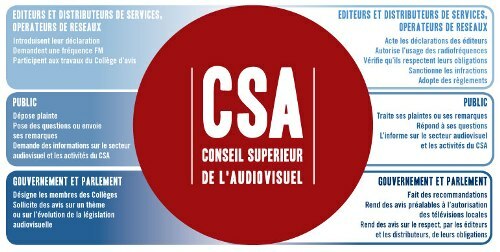 The CSA is the independent administrative authority in charge of audiovisual regulation in the Wallonia-Brussels Federation (the French speaking community of Belgium). The CSA’s departments are divided according to the type of audiovisual media services under the CSA’s jurisdiction (TV, radio, new media, audiovisual media services distributors and network operators). It has an investigation authority in charge of receiving and investigating complaints from citizens that can lead to decisions by the authorization and control Committee, the deciding authority of CSA. A research department has also been created in order to make, follow and sustain studies about the broadcasting field and its regulation in Belgium and abroad. All departments are supported by the work of several experts in charge of the main thematic legal competences (diversity, pluralism, protection of minors and human dignity, elections, advertising, digital transition). CSA also houses a resource center, rich of thousands of publications regarding the broadcasting field.